Quinn is a light grey cat with black stripes. 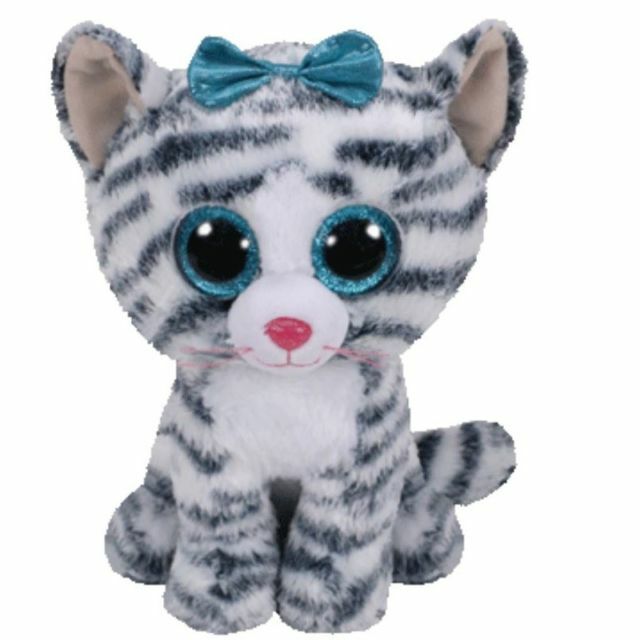 She has large, glittery blue button eyes and a bright pink button nose with pink whiskers. Her muzzle and belly are both white and she wears a sparkly blue bow on top of her head. We take lots of naps and then we just play. Quinn was released in October 2017. Her Birthday is on 12th September. Quinn is a Claire’s exclusive Beanie Boo. There are four versions of Quinn. This medium 9″ Beanie Boo Buddy, a small 6″ Beanie Boo, a large 16″ version and a key clip.